Just about everybody is looking for ways to boost energy, but many of the products they use aren’t too healthy. They might reach for a soda, a branded energy drink, or make a sugary cup of coffee. None of these are healthy energy boosters, and with the incredible amount of sugar and caffeine these drinks contain, they are very likely to cause a pretty hefty energy crash. Instead of grabbing something like this, go for liquid nutrition. Liquenergy is an energy boosting supplement that combines a number of vitamins, minerals, herbs, vegetables, and fruits to create an all-in-one dietary supplement. These healthy energy boosters can help you get the pep in your step that you need, while also improving your immune function and much more. The minerals are organically sourced and we use select natural ingredients. Before taking any new energy boost supplement, be sure to discuss it with your healthcare provider. 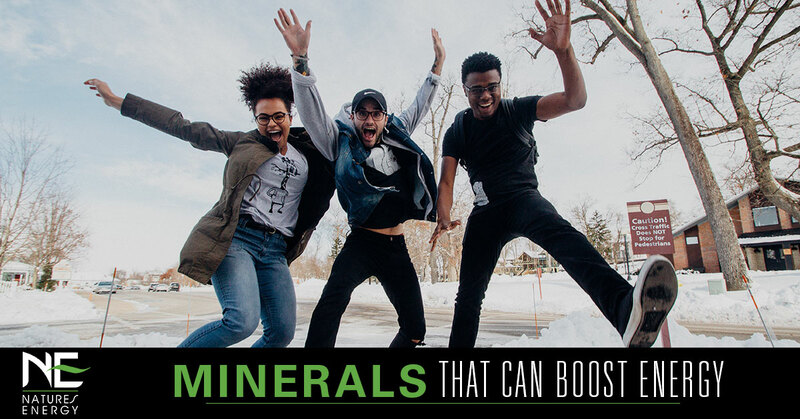 Here are some minerals that can increase your energy! CoQ10 is a powerful antioxidant that exists in the mitochondria, which is the energy center of the cells. It actively searches for, and destroys, free radicals in the system that cause heart disease and other heart disorders. Your heart works nonstop, and the energy CoQ10 provides is essential to keeping it healthy. Your body naturally produces CoQ10, but its levels can decrease with age, usually beginning in your forties. CoQ10 is more effective when taken with L-Carnitine. Zinc is a mineral that is essential in promoting your immune system function, and it aids in healing. It boosts the thyroid, helps with hormone production, and aids in digestive functions. Because of its anti-inflammatory properties, it has been used in conjunction with cancer treatments and heart disease. When you’re not getting enough zinc, you might find that you’re fatigued. Where some believe they should pop a zinc pill only when they’re sick, having consistent zinc supplementation is ideal. Selenium benefits the thyroid and promotes the production of the hormone T3. It plays a role in immune function, and is an antioxidant that wards off damage by free radicals. Additionally, it aids the body’s metabolism, helps with circulation, and helps the body fight stress and infection. It’s also shown promise in fighting cancer and heart disease. As an antioxidant, it has been found to clear plaque buildup, which can cause memory issues and brain fog. Iodine is essential to thyroid function and is responsible for producing thyroid hormones. Thyroid hormones play a large role in metabolism, which is the process of breaking down the foods you eat and converting them to energy. When you don’t have enough iodine in your diet, your thyroid’s function slows, your metabolism slowing with it. It works in concert with selenium. Magnesium is a mineral that is required in the production of ATP, which transports energy through the cells. This energy is responsible for metabolism, cell division, and so much more. In order for ATP to work, it must bind to magnesium. High levels of stress can actually deplete the magnesium levels in your body, and low levels of magnesium can lead to changes in mood, migraines, anxiety, and insomnia. Liquenergy by Nature’s Energy contains all of these healthy energy boosting minerals. Our exclusive formula is an all-in-one dietary supplement that’s caffeine-free and won’t lead to an energy crash like other drinks. And the delicious orange, peach, and mango flavor tastes amazing! Our liquid nutrition drink is a great option if you’re in need of an energy boost supplement. Order yours online at Nature’s Energy today!